Anyway, we figured it’s be great to actually get a train all the way into Port Alberni, even if it ended up at a temporary staging yard of sorts, as I haven’t had time to focus on doing up a real, accurate track plan for P.A. Side note here. Earlier, Cam and I were discussing the track plan and realized that the tight confines of the trackage near the wye in Port Alberni was a guide, but we needed to make sure what was planned was actually doable. As such, I’m going to draft up the plan in CadRail and then print it full size so we know exactly where things go. Needless to say, such a plan is going to take a while to fully draft. For a very long time, we’ve had the sub benchwork down the hill started… But not quite complete. This past Saturday, Cam and I worked on fixing that, and getting that little bit of track board finished and secured. After a bit of a meal, we got the contact cement out and laid the cork from where we left off just prior to the MP25 trestle, all the way down the hill. As we weren’t going to put cork in P.A. 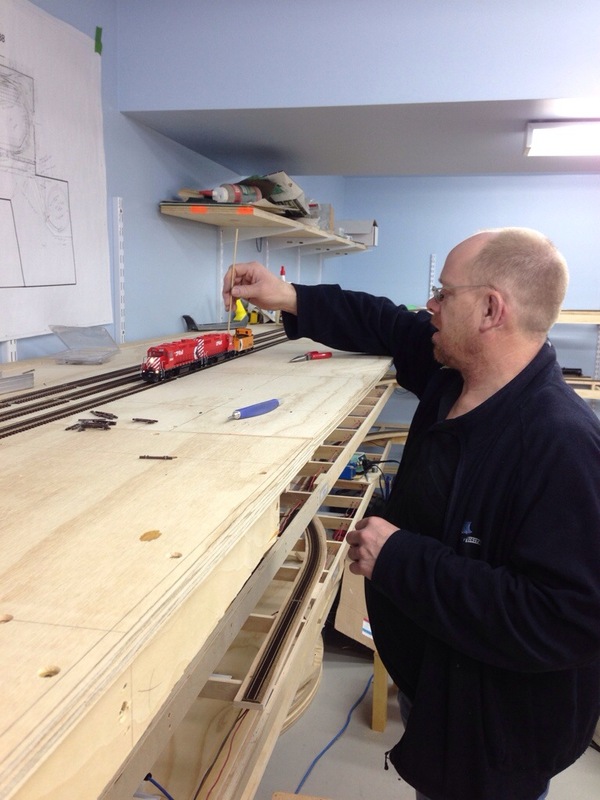 until we had a plan, we used a long cedar shim to ramp the track from the cork to the plywood. After dinner, track laying down the hill began in earnest, and that was complete that evening. Of note, we actually slightly superelevated the curves on the way down the hill, for some aesthetics, but more for keeping runaway rolling stock from wanting to jump the rails on the way down. Sunday, Cam arrived and we got the temporary staging yard built. A three track, double-ended affair with commercial #6 turnouts, it’s not great looking, but will hold two full port freight trains… One to arrive and the power can switch the caboose off and put it on the other train and come back to Wellcox with a different train. 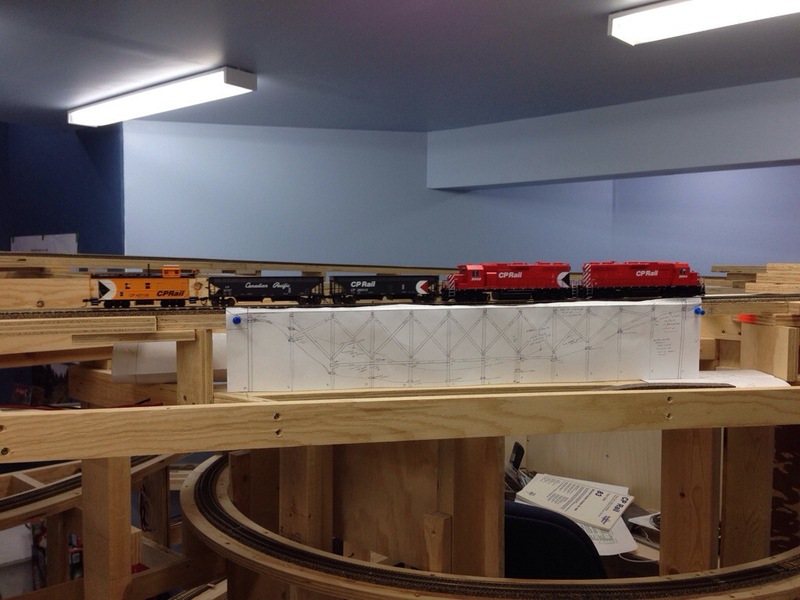 We cleaned up the layout after the trackage was complete, powered up the layout and ran a couple GP’s (3000 and 3004) up to Port to see how far we’d get. Surprisingly enough, we got all the way to the yard, and into it! This entry was posted on March 31, 2014. It was filed under Benchwork, Trackwork. Just in case you thought you were the only crazy one…I had a concert I had organized on Friday, with the club out here on Sunday. It was a long weekend, but a fairly fun one. Mike Walton brought his presentation for CARM out here, which is quite interesting. (it’s another UK layout…but a very impressive running distance of ~530 ft).